San Diego Comic Con gave us our first sneak peek at the new character that will be introduced in issue #8, Whisper the Wolf! Whisper was created by Ian Flynn and designed by Evan Stanley. Whisper has some interesting and unique tech, that as her name implies, utilizes Wisps. Beyond introducing Whisper, the panel also showcased the 3 covers for issue #8. 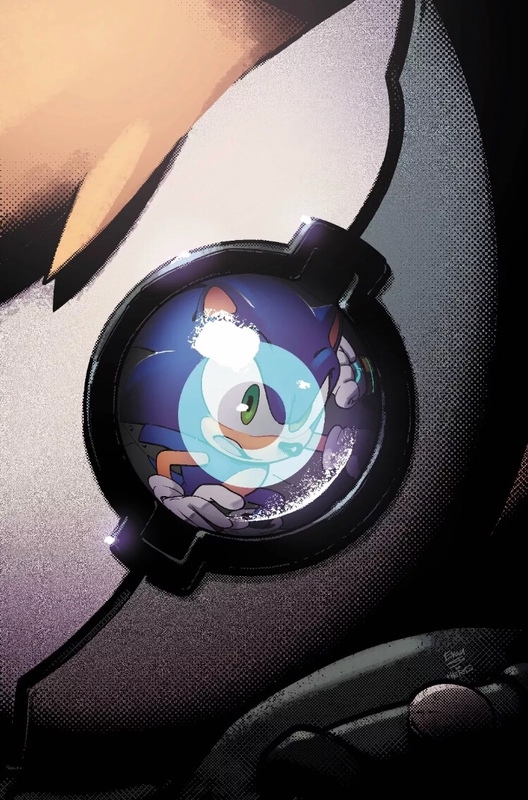 Evan Stanley was previous announced to be illustrating the A cover, which shows Sonic and one of Stanley’s favorite characters, Silver, in Whisper’s cross-hairs. While bother covers are visually stunning, the fate of Gigi’s cover is curious! Diamond solicitations are submitted months a head of time and subject to change, one must wonder if unknown circumstances caused Gigi’s cover to be cancelled or delayed. Alternatively, we may see additional covers, yet to be announced, to celebrate the new character like we did with Tangle’s debut in issue #4. Regardless, we are currently looking into the matter to see if we can shed any light on this discrepancy! We will update the post as soon as new information becomes available, so check back later! And last but certainly not least is Nathalie Fourdraine’s retailer incentive cover feature Sonic and Silver that was revealed with the solicitations! What do you think of the new covers? Do you like the 2 perspectives gimmick? Are you excited to see Whisper in action next month? Let us know in the comments below!